Two years ago, I spoke at a conference to talk about search engine optimization techniques and strategies. I had been blogging for 10 years, and was a web designer for even longer, so I knew something about how to get a great position in the search engines. That workshop had been valuable from as far back as early 2000 until recently, but the influx of social media, hashtags, influencers and Google changes have made some of those early tips null and void. Some are just as important though. 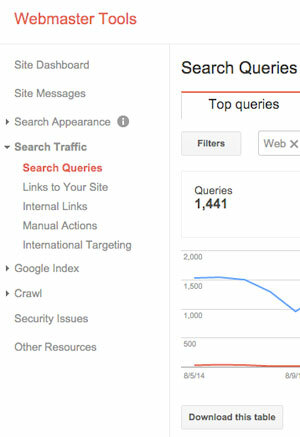 Here’s what I’ve learned about how to approach SEO in 2014. The Google AdWords Keyword Tool has been gone for about a year now (replaced with the new Google Keyword Planner). Many bloggers, myself included, relied heavily on this tool; however, I think our reliance was misguided. The keyword tool only measured what people were willing to pay for and was really created for products. It was specifically created to work with AdWords and while the hack that most of us used it for was fine, its data was probably not as relevant as we believed – at least, for those of us more interested in organic search results who didn’t use AdWords. In retrospect, I now feel freed from hours of pouring over results that may or may not have had a beneficial return on the time I invested. 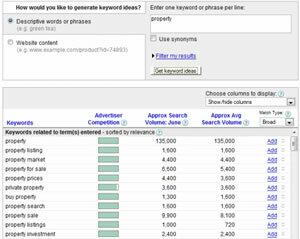 There are better ways to find out optimal keywords than these keyword tools. You should be using Google Analytics and Webmaster Tools, and going to the source for SEO information. Instead of wondering what’s new, good or outdated, simply start following and watching Matt Cut’s Google Videos, which are organized by topic at SEO In House, to answer your questions. If you installed Analytics a while ago, make sure you are upgraded to Universal Analytics and have the new code pasted into your site. Really dig in and examine your analytics. Click your blog under “Webmaster Tools,” go to Search Traffic, select Search Queries and download the table. I advise importing it into Excel, so you can sort it. It will give you the real story of how people are getting to your site. Some years back, I had a small business client who spent a ton of money engaging an SEO firm. They researched a 3-word phrase and then created a page where they repeated that phrase in a document – ad nauseam. No human would read that page. At the time, that kind of SEO was technically acceptable. Personally, bending and shaping words to match the exact 3-5 word phrase I believed people to be searching for has always been a painful exercise for this wordsmith. How could I put my name on something like that and still build my reputation as a writer? Turns out, you can’t. Thankfully, Google can handle whatever you write. It’s smart enough that you can place the group of words in the same or near order and still get the juice for your keyword phrase without being redundant. You do have to be careful as your long tail grows, but my best advice is just to write the best you can. You will find that from time to time, you are writing articles with no other way to say a word. For example, I just completed a piece on grass fed vs. conventionally raised cattle. There’s no other way to say either of those terms accurately, so they were repeated throughout the article. Good for my SEO, but not necessary every time. It’s time for all of us to go back to Journalism 101 and write or curate valuable content for our audience. If you have a new blog, don’t write too much until you start to build readership and connect with the leaders in your niche. Headlines and descriptions should entice or scare people into clicking. Articles should give provide readers with something they need and engage them, even if there is a call to action in it that benefits you. Write from top down, with all the good information up front. After you’ve done all that, then you can go back and think about SEO. Odds are, you will be right on target. This has more to do with finding your accurate target rather than search engine placement, but it’s the smart way to narrow your competition. This is where sources outside of your blog come in to play, and one of the reasons why you need to be active in your niche or all the niches you cover. Here’s an example. I write for a natural blog, Mamavation.com. One of the topics we covered this summer was how to do an armpit cleanse – that is, how to safely switch from commercial underarm deodorants to an organic brand or homemade. It turns out that no one had written much on this topic, which is a burning question in the organic community. The article I wrote got noticed by someone at Mercola.com, a site heavily frequented by this community, and went viral. 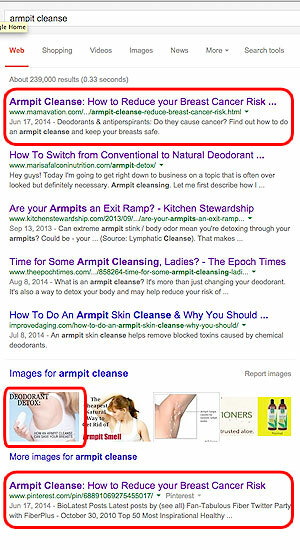 Today, my article is #1 at Google for the phrase “armpit cleanse,” my image comes up first under “Images,” and a pin for this article is result #5. They key was creating a solution to a common question in this niche and making it the keyword phrase, so that bigger names would find it, link it and share. Going viral will help your SEO strategy, and that means knowing your community, what they want and what they don’t know. Listen to what this community is talking or debating about, see what’s new, find the controversies and always be on the lookout for unanswered questions. If you have a lifestyle blog that covers several topics, do this process for each section. This will help you know what keywords your target is searching. Once upon a time there was a list of things you could do to ensure your site positioned well in search results. We all used to obsessively check page rank, carefully repost text, repeat keywords, over-examine our meta tags and labor over URL names. None of these techniques were inherently bad but they made for poor writing and inappropriate priorities. For example, URL name is not as important to Google as it once was thanks to link farms and other abusers. Title tags are great for separation and logically placing a keyword, but don’t necessarily carry extra weight anymore. Repeating words all over your blog is not the healthiest way to get search engine traffic either. However, it is important to write meta descriptions and page names that are memorable, concise and attractive, so that when your page comes up in search engines, people will want to click it and can remember the name. We all got off track when we starting thinking of SEO as a list of tasks, when what we should have doing is organically growing our blogs to the right community, writing the best we can, and promoting our work for a larger percentage of our working time to key players. Research and credit your links, use bullets, create pinnable images, tag others, be honest and use your voice. Combining all those things will not only spike your search engine engine placement, it will also build your brand, target your content and draw your audience from a variety of venues. This modern approach to SEO will hold up over time. It’s time we stopped thinking about SEO as a “to do” list and started thinking about it as an organic result of all our marketing efforts. 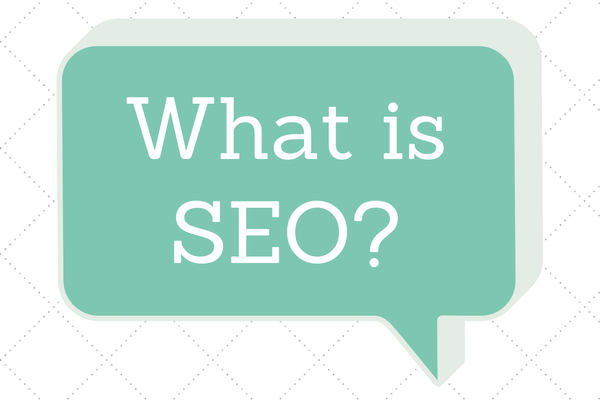 If you’re just starting out, check out SEO 101 For First Time Bloggers.